Today I had a look at the SharePoint connector in Microsoft Flow and there are two new trigger and one new action. In this post I’m going to have a look at the “When a file is deleted” trigger. Then when you look at the information available after this action within the dynamic content, it is easy to find out which file was deleted and who deleted the file. It is even possible to find out when it was deleted. Although it isn’t possible to undelete the file or to get to the content of the file at least you can now trigger process that you would like to start on deletion of a document. 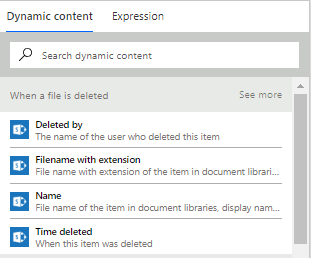 Looking at the name of the dynamic content “List of Deleted items”, I would have expected that deleting multiple documents would only trigger one flow. This however is not the case. When you delete multiple documents you only get one document listed in each flow and multiple flows will be started. Deleted By username displays the user’s display name rather than their user login. I’m not sure if this could cause problems, but it is at least something to be aware of. Then I tried deleting folders and this trigger even handles the deletion of folders within your library. in short this looks like a nice improvement to the Flow offerings. Other than handling items rather than handling files in libraries there is no real difference. Great to know it! This is something that I missed several times! Indeed! The flow team have made some major improvements yesterday! The HTTP request action is another one of those other important changes. But now I want to also create a Flow to delete an item if it’s deleted from SharePoint. I found the “When an item is deleted” action but I’m stuck, the Get Item action can’t be used because the item is already deleted. Please assist, it will be greatly appreciated! But now I want to also create a Flow to delete a calendar item from the users calendar if it’s deleted from a SharePoint Calendar. And indeed it is not possible to get to the data of the deleted item. Therefore the only way you could identify the calendar item would be by storing the ID and Name in the calendar item somewhere. You could probably use the above information tho get to your deleted item in the recycle bin. I will create a post for this shortly. Thank you for your quick reply! I do have a custom column in SharePoint named “outlook event id”, Outlook fill this field. ( see hxxps://powerusers.microsoft.com/t5/Building-Flows/SharePoint-Calendar-and-Events/m-p/121418#M11799) However I don’t seem to be able to use this field when using the “When an item is deleted” action? I don’t think that there is an API to get to the custom properties of the deleted items in a recycle bin. Hi, very nice write up. Have you found a way to access the recycle bin with Flow? I’d like to get some more properties from the deleted file. 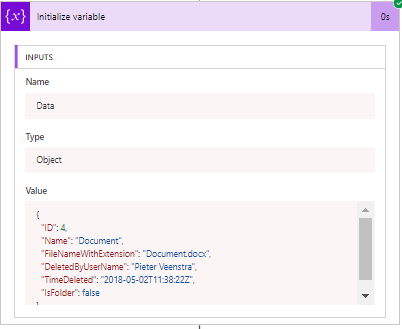 You can get to the recycle bin through the rest API ( /_api/web/RecycleBin ), however that isn’t going to give you any of the metadata that originally belonged to the document.